Let's take a step back. What exactly is Advent? 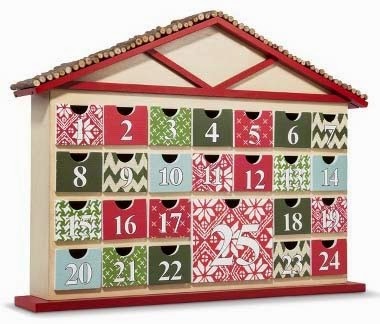 What is the purpose of an Advent calendar? This isn't a religious lesson. Just wanted to give a little background! Simply put, Advent is the season in the Church year when we prepare for the arrival of Christ's birth. Jesus is the reason we celebrate CHRISTmas in the first place. The Advent calendar is a special way to count down or celebrate the days leading up to Christmas. We have always celebrated the season of Advent, but have never actually had a "calendar". In the past, we used the Advent candle wreaths that the kids made to count down the weeks to Christmas. I bought this calendar that I intend to use every year to get us started on our own "Advent calendar" tradition. Each day, the kids open the appropriate drawer and find a little note. Those drawers are tiny, so I don't stick anything but a note in them. On each note, the kids read two things: 1) what their "treat" is for the day, and 2) their special Advent activity for the day. This time of year is very "sweet" for the kids since their daily treats are usually sweets-related. It can range anywhere from having a candy cane to grabbing yogurt or ice cream! Some of the special Advent activities they do include: reading biblical Christmas stories, saying special prayers at bedtime, making handmade cards, creative writing, watching holiday movies, donating to charity, etc. This year, we are also incorporating the making of our gingerbread house with the Advent activities. The kids like to do the icing and "stick" the candy on. It's a messy job, so just lay out lots of newspaper or a disposable tablecloth! Have some wipes handy too. May the season of Advent help us remember the reason for the season!